Expanding our Kids World in Smyrna, DE is the newest recipient of an Imagination Playground and Play Associate Training (valued at over $7500)! The daycare center garnered a record-breaking 11,700 votes in the Imagination Playground VOTE for Play program, the most votes among the thousands of schools and organizations across the United States that participated. We would like to send a warm and heart-felt “thank you” to everyone who helped make this dream come true. Expanding our Kids World in Smyrna, DE is the newest recipient of an Imagination Playground and Play Associate Training (valued at over $7500)! 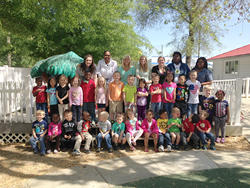 The daycare center garnered a record-breaking 11,700 votes in the Imagination Playground VOTE for Play program, the most votes among the thousands of schools and organizations across the United States that participated. An incredible feat for their school and community! This family-owned and operated childcare center in Smyrna, Delaware has been in operation since August 2006 and are licensed to teach, care for, and facilitate 138 children. The goal of EOKW is to nurture each child’s unique qualities and potential by creating a curriculum that exceeds their intellectual, social, emotional, and physical skills. “Imagination Playground Blocks are going to enhance each teacher’s abilities to broaden our chilldren’s imagination and creative learning to a whole new level. This has been a wonderful opportunity to foster parental and community involvement. With the collective efforts, we were able to achieve a stimulating new play system that invokes creativity, sparks critical thinking, and is a huge benefit to our students here at Expanding our Kids World,” shared Marlena George, Director. Imagination Playground will be extending the VOTE for Play program for another voting period. From May 26 through July 15, schools and organizations will have another chance to cast their votes to be awarded an Imagination Playground and Play Associate Training. The awardee will be announced on July 17th. Just visit http://www.imaginationplayground.com/vote-for-an-imagination-playground.html to learn more. To learn about ongoing updates on the voting, follow the Imagination Playground on Twitter at http://www.twitter.com/ImgPlayground or like the Imagination Playground on Facebook at http://www.facebook.com/ImaginationPlayground. To find out more about the Build-A-Thon promotion, which Mr. Krishock spoke of, visit http://www.imaginationplayground.com/build-a-thon.html and learn more. Imagination Playground is a breakthrough play space concept developed to encourage child-directed, creative free play. The kind of play that experts say is critical to children’s intellectual, social, physical and emotional development. Created by architect and designer David Rockwell and the Rockwell Group, Imagination Playground enables children to play, dream, build, and explore endless possibilities. Imagination Playground finds its home in daycare centers, kindergartens, elementary schools, children’s museums—and science, nature, discovery centers, camps, community centers, children’s hospitals, hotels, public parks and more—in North America and over 60 countries overseas. For more information visit http://www.imaginationplayground.com.